Dr. Dunson has been practicing optometry since 1979. Dr. Dunson was born and raised in Tallasee, Alabama. He graduated from the University of Auburn with a Bachelor of Science in Pre-Optometry. From there, he attended Southern College of Optometry in Memphis, Tennessee where he received his Doctorate of Optometry in 1979. Dr. Dunson is certified in Injectables and Minor Surgical Procedures. 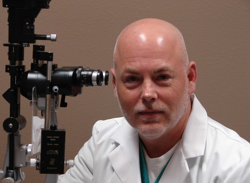 Dr. Dunson provides full scope patient care including comprehensive eye exams, 'difficult to fit' contact lenses, ocular disease and pre & post-operative management of: cataract, oculoplastic, and refractive surgery (lasik) patients. In addition, Dr. Dunson provides treatment and management of glaucoma, dry eye syndrome (DES), computer vision syndrome (CVS) as well as other diseases such as macular degeneration (ARMD).